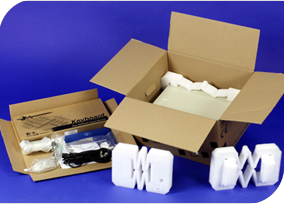 Synergy Packaging are a leading UK provider of protective foam packaging solutions. 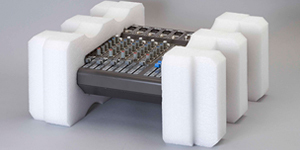 Our services cover a comprehensive range of foam packaging services from design to fabrication. 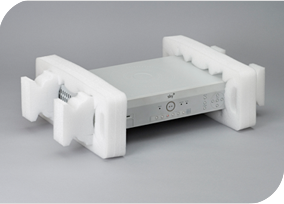 We will manufacture performance foam packaging which will perfectly meet your needs. Contact us to find out how our team of experts can help. 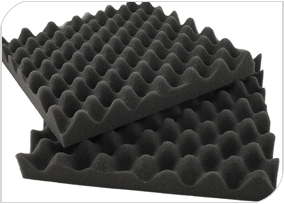 Polyethylene (PE) foam is a high performance cushioning material. 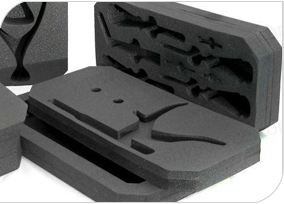 Whether you want standard foam pads for lining a box or a tailored foam solution to protect your products, there is a PE foam solution to meet your specific requirements. This material comes in a wide range of colours, densities and sizes and brand names include Stratocell®, Polylam®, Nopaplank®, Novastrat® and Foampack®. Synergy Packaging are one of UK’s largest fabrication and conversion companies using these materials. There are also endless other possibilities for this flip out hinge solution. The parts are designed in a way that when folded and offered to each other, the resistance of the fit will lock the components into place to offer performance and protection in key areas. The foam is designed to allows the material to stretch and expand, which gives a greater coverage with no extra material, maintaining maximum protection. If you then combine this type of foam packaging design with the hinged foam pack concept you will have a truly cost effective performance pack. Conventional Polyethylene foam end caps and protective packs are made by die cutting the component parts and then bonding them together using adhesives to form a 3 dimensional protective cushion. Polystyrene foam is used for a range of applications including packaging, thermal insulation and decorative mouldings. The main forms of fabrication of this material are using either a hotwire to form intricate shapes from a foam block or to mould the pre-expanded foam beads into the desired shape. Our sales will be happy to work with you through a process of design and develop the right solution for you. 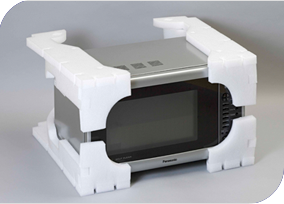 As well as the extensive range of conventional foam packaging products we offer at Synergy Packaging, Utilising the wide range of equipment we have across there are a number of d services we can offer in the fabrication and conversion of other more specialised foam, rubber and polymer based substrates. Applications include; Transit Case Inserts, Tatami/Gym Mats, Custom foam profiles and Cross-linked foam (XLPE) products.